For the second time today, I encountered a site that made visitors upgrade to the latest version of Flash (9.0) before they could see a new feature. 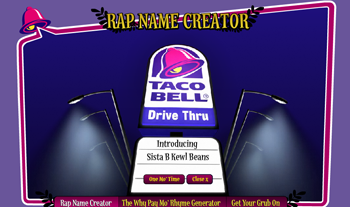 The first was Jacquie Lawson’s latest e-card and the second was TacoBell, which has a way cool interactive rap rhyme game to promote its low prices. For all the geeks online, there also are millions of senior citizens; technophobes; people who’ve never downloaded software themselves and who are afraid they’ll break their computer if they do. Think about them next time you add a really cool feature to a website. Make sure the instructions are completely clear to non-geeks. After all, you don’t want to end up preaching only to the choir.